Thank you for volunteering for the Alt Prom on Saturday May 18, 2019! The event is at Downtown Kaleideum: 390 S. Liberty St, Winston-Salem, NC 27101. 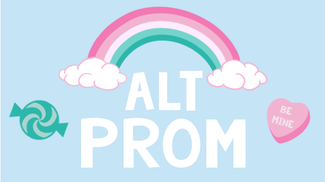 Please note that all ALT PROM VOLUNTEERS are required to attend a one hour orientation session, presented by our youth leaders. There are three dates from which to choose listed at the top of this signup genius page. The location of the orientation is the North Star LGBTQ Community Center: 930 Burke St., Winston-Salem, NC 27101. You should choose time slots and jobs you are interested in, but this does not guarantee that we will not assign you elsewhere as needed. We ask that our volunteers wear something comfortable for them (formalwear is not required for youth attendees or volunteers); we will provide nametags (or similar) at the event to denote who is volunteering. Help set up food and beverage tables, check-in table, resource tables, glam station, photo booth, tables for raffle prizes and games, hang up directional signs, etc. Help set up all decoration pieces for our Candyland theme. Assist with other set up as directed. Help check-in volunteers and get them to their set-up tasks and/or stations. Work closely with Nyles and Jamie to keep everyone organized and on the same page. Must be okay standing for an hour and helping to direct youth, parents, and volunteers within the parking lot. Greeting and directing youth. Collect donations, sign-in sheets, give out wristbands and raffle tickets. Dance floor chaperones should be comfortable with loud music. Restocking and maintaining cleanliness of tables. Be our photographer's right-hand person, help gather contact info and permissions info where necessary from the youth. Breakdown tables, clean up, remove decorations and load out. Should be comfortable with some lifting and carrying.